This trip is a long one: 14 hours just for the drive, and obviously stopping to experience the sights will take even longer. You’ll need a parks pass to access most of these sites. 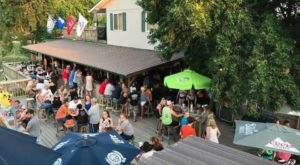 We recommend going on a long weekend so you have time to enjoy all of the stops. 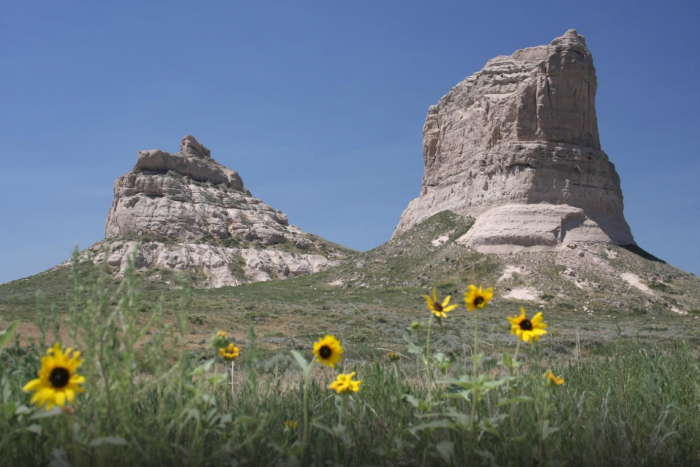 Pack a weekend bag, grab a cooler full of snacks, and jump in the car – you’re about to experience some of the most beautiful parts of western Nebraska. You can find the map, along with step-by-step directions, here. 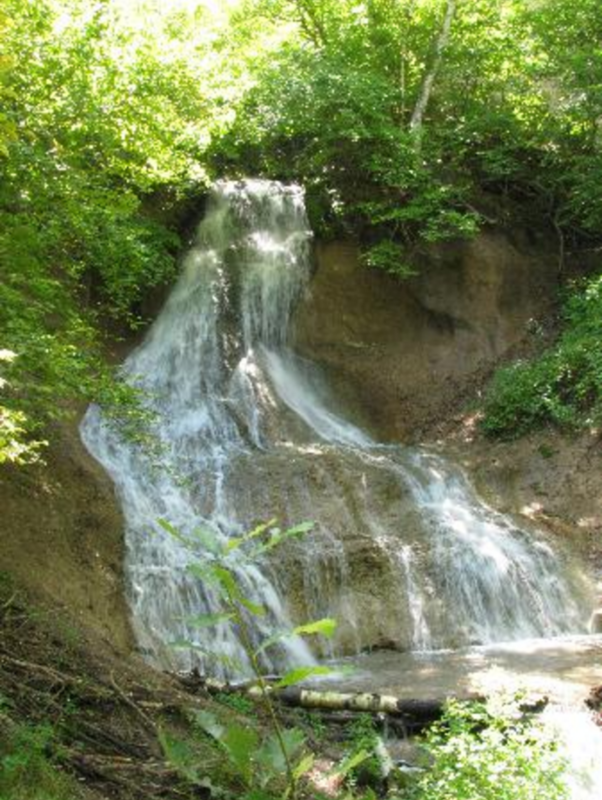 Our first stop is at the majestic Smith Falls, Nebraska's tallest waterfall. 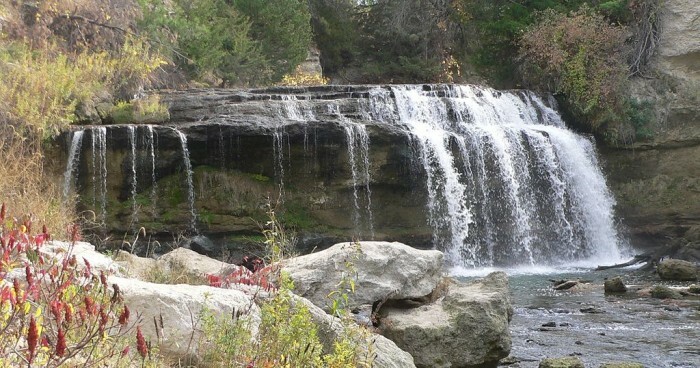 The falls are only accessible after a short hike, so wear sturdy shoes - your flip-flops won't cut it here. 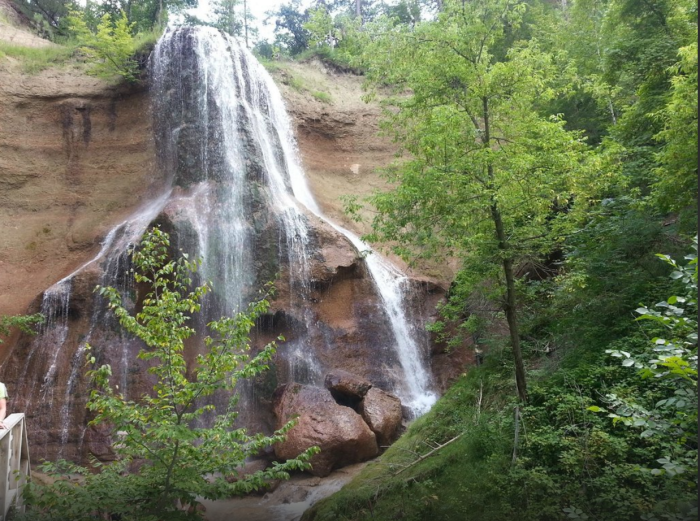 You may not get lucky enough to see a herd of bison on your stop at Fort Niobrara National Wildlife Refuge, but you won't need any luck to see the splendid Fort Falls - it'll be right there waiting for you. 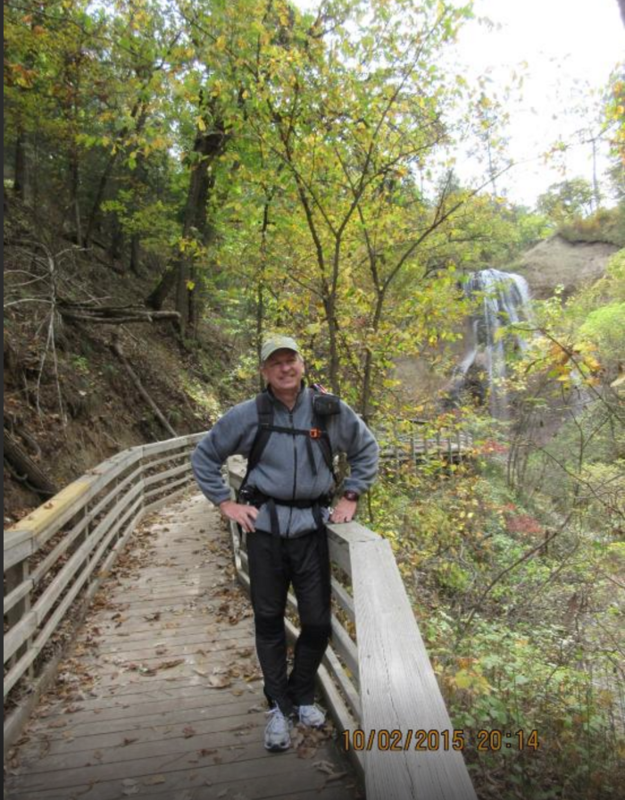 You'll need $1 per adult to see the falls, but it's well worth the admission price. 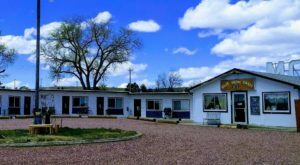 After a long but lovely drive along scenic Highway 20 (also known as the Bridges to Buttes Scenic Byway), you'll reach Pine Ridge National Recreation Area. 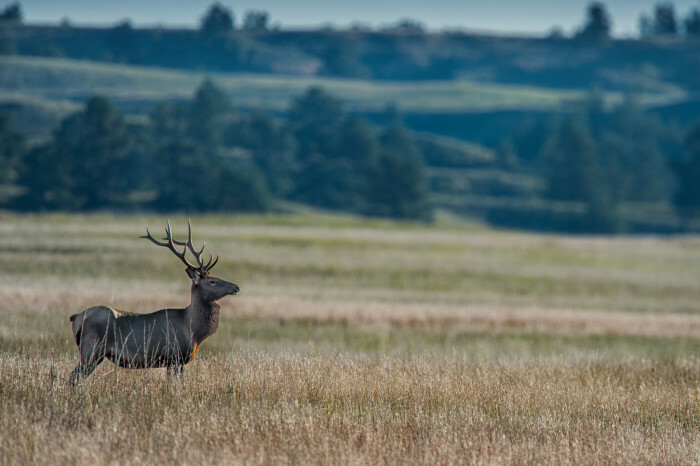 The drive from Smith Falls to Pine Ridge is around four and a half hours; this serene, largely wild setting would be the perfect place to camp after your first day on the road. Try to fit in a bit of hiking before you bed down for the night. 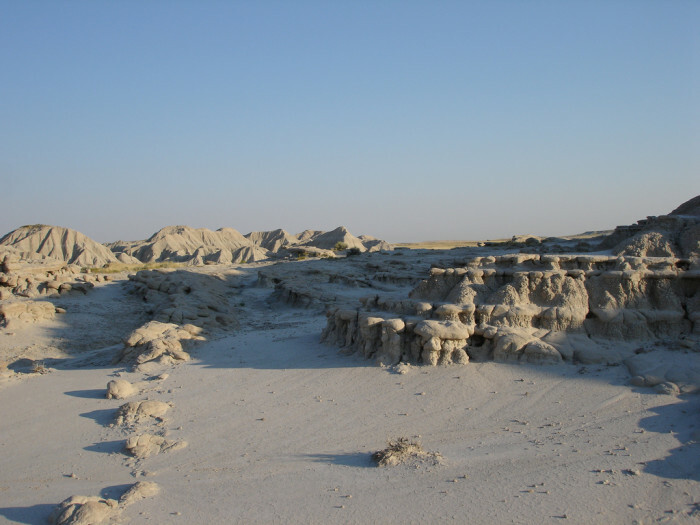 You'll want to allow plenty of time to wander through the lunar-like landscape of Toadstool Park. 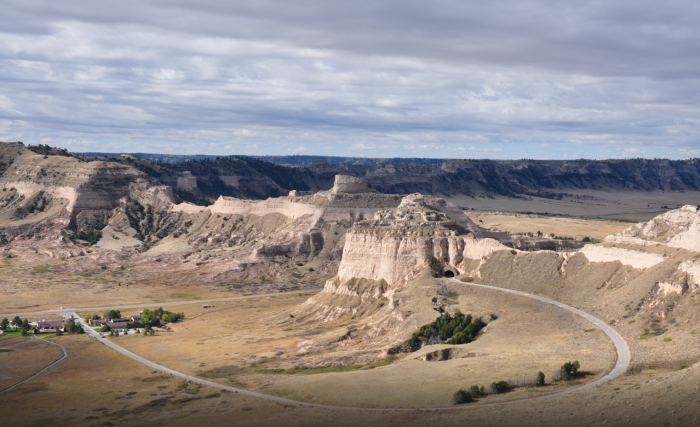 Sometimes called the Badlands of Nebraska, this place is seriously enchanting. 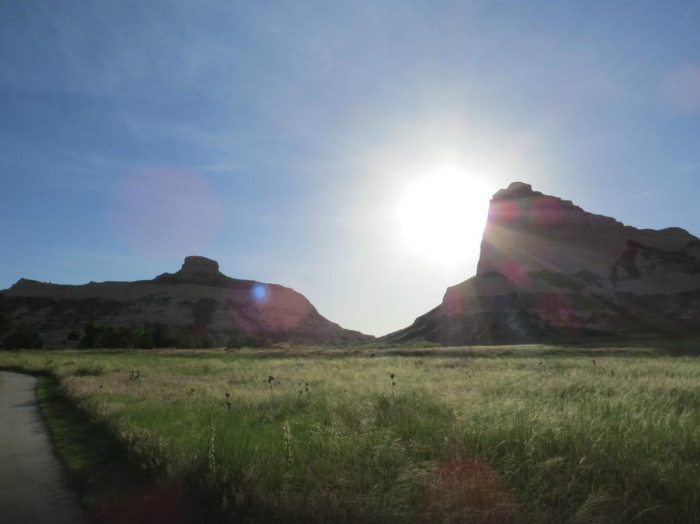 You can't visit western Nebraska without a trip to Scotts Bluff. 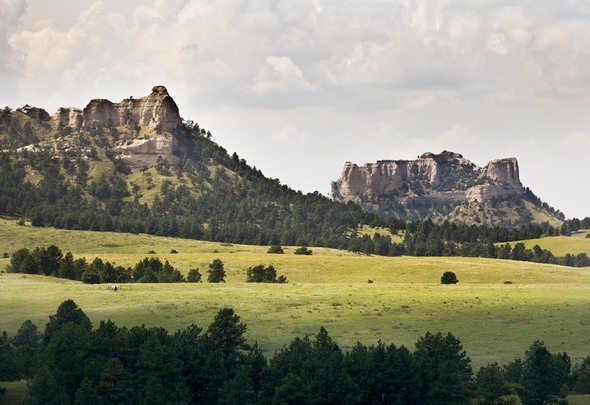 The view from the top is impressive, and walking around the area will make you fall in love with Nebraska nature all over again. 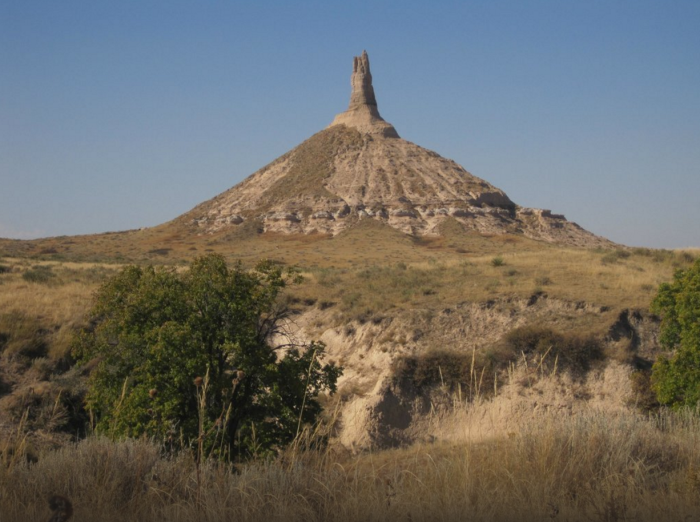 The monument is on the historic Oregon Trail, so as you explore the site you'll be walking in the footsteps of American pioneers. 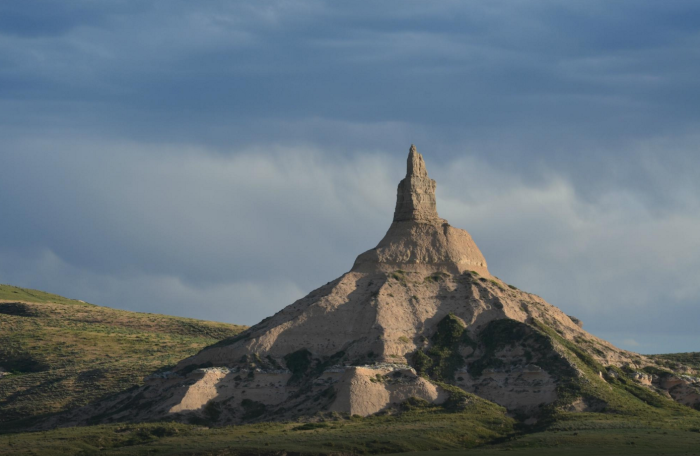 Another standard stop on any Western Nebraska trip, Chimney Rock is about 30 minutes from Scotts Bluff on the Oregon Trail. 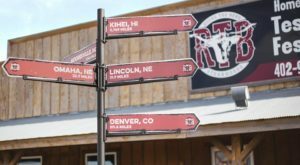 Check out the visitors' center for some fascinating information on the site's history and the surrounding area. 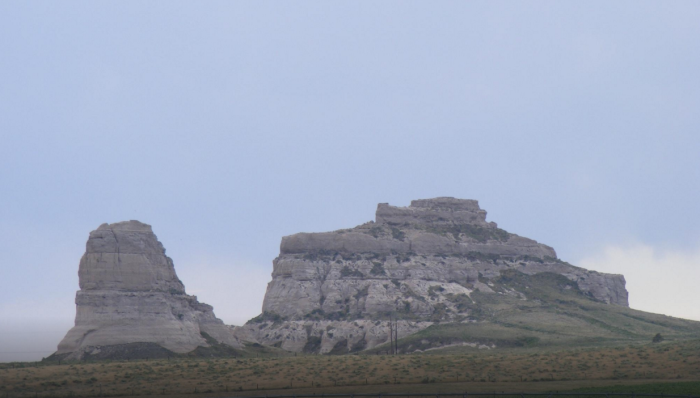 Another 30 minutes or so down the road, these large rock formations would have been the first major geologic landmarks seen by settlers headed west on the Oregon Trail. 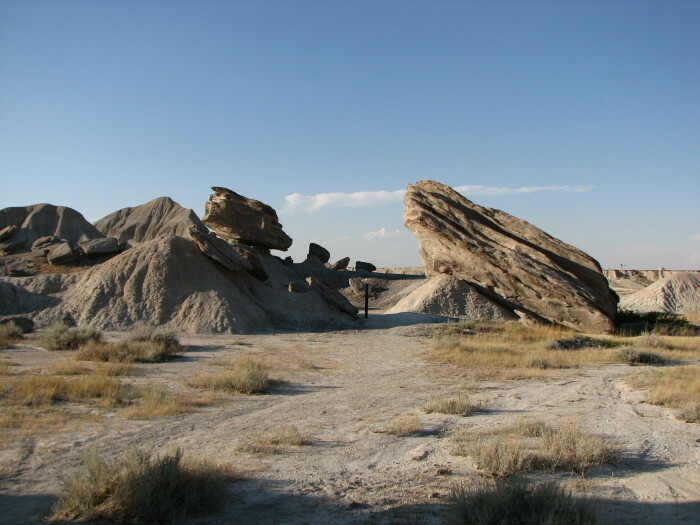 The remnants of the Courthouse Pony Express station are at the southwest corner of the formation. 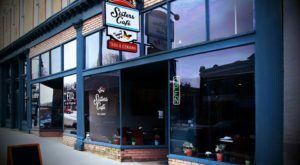 Stop off in Bridgeport or Alliance for the night before beginning the last leg of your journey. 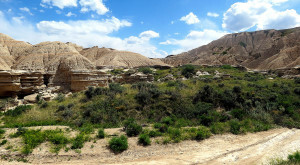 After the rock formations, it may look like a long stretch of empty road in front of you. This couldn't be further from the truth. 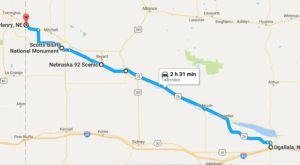 Highway 2 is known as the Sandhills Scenic Byway, and it's a part of Nebraska that many tourists never see since it is a fair distance from the interstate. This route was rated as one of the top 10 scenic routes in the United States. Besides the gorgeous scenery, there are plenty of sweet little towns along the way - make time to stop off in one or two of them on your way. 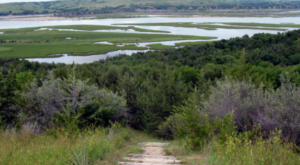 Finally, you'll find yourself at Valentine National Wildlife Refuge. 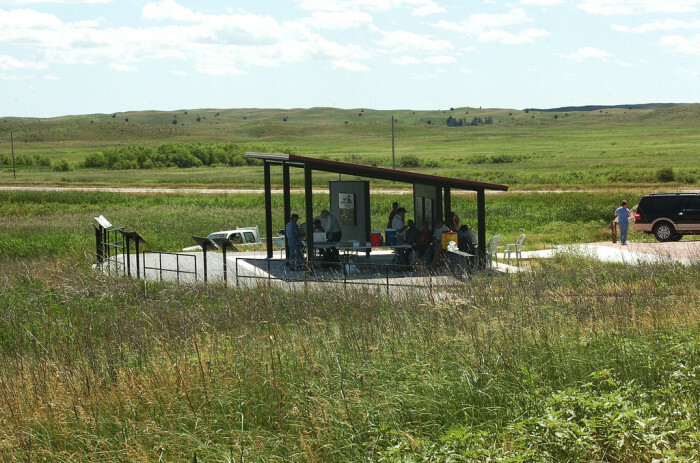 In the same complex as the Fort Niobrara Refuge, Valentine NWR is a breathtaking Sandhills destination. 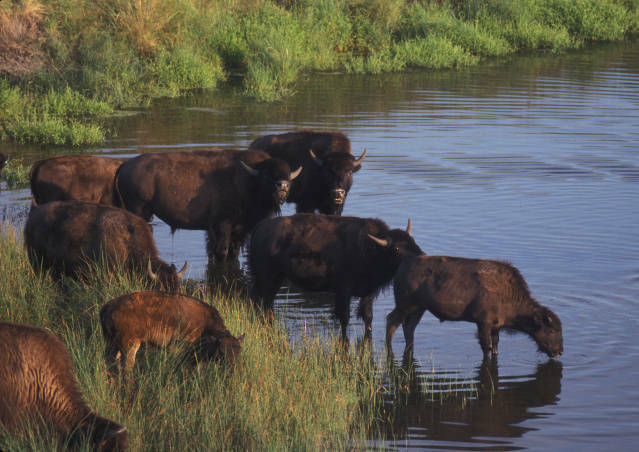 There is abundant wildlife here, along with plenty of places to picnic while you watch the native animals play. 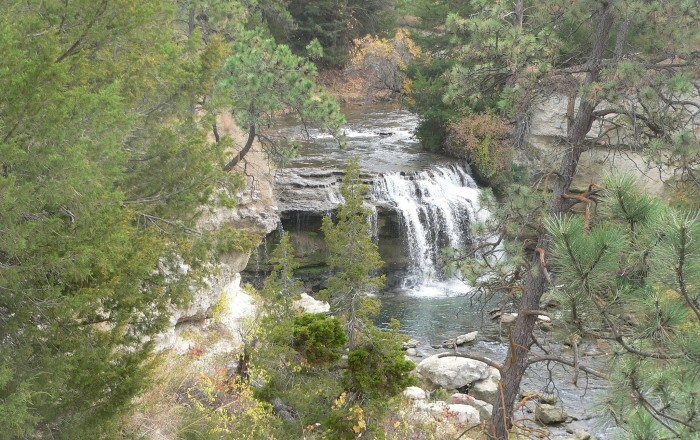 A short trip from Valentine NWR to Smith Falls brings you right back to where you started. 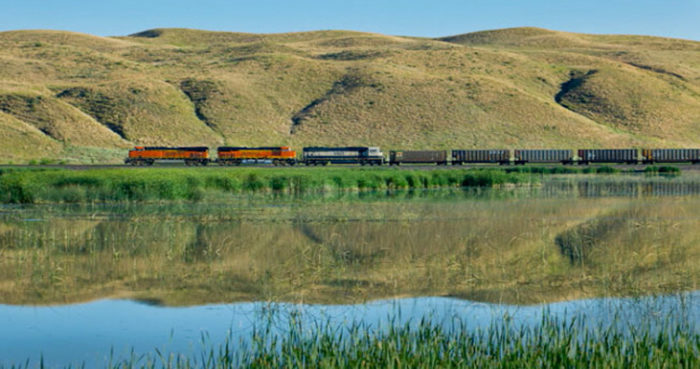 This road trip was all about natural wonders, but if you have extra time we would definitely suggest taking side trips as you see interesting places pop up along the way. Every small town has a story to tell, and every park and recreation area has its own special characteristics. 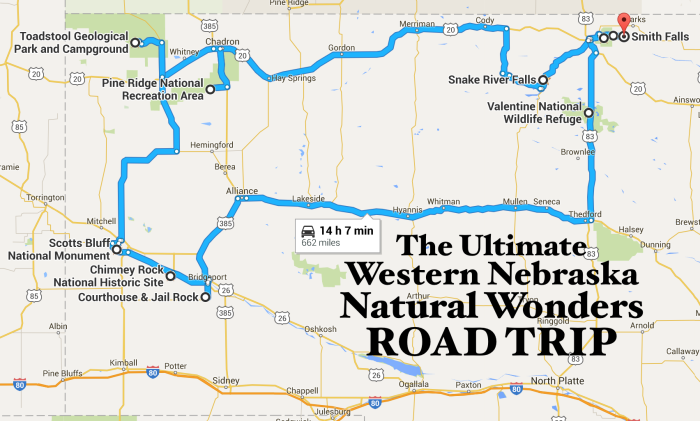 We couldn’t fit every possible stop into one map, so be spontaneous if you can, and let the road take you where it will. 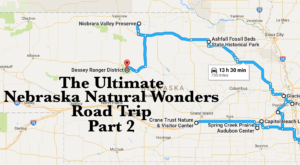 If you decide to do our road trip, be sure to leave us a comment telling us all about it!